Totana has one of the biggest and most varied concentration of craft workshops on a provincial scale, its production puts it in direct competition with Granada and its cultural permeability has generated rich craftmanship in which arab influence can often be seen. Passed from parents to children through uncountable generations, together with the old inherited techniques, handicraft has reconciled the new methods and forms to the requirements of each era. This tradition has opened the door to a new handicraft which despite its modernity doesn´t leave the older, traditional pottery to one side: like the treatment of leather, embroidery and several other crafts. The majority of the workshops are family owned and selling and manufacturing both take place there and then. 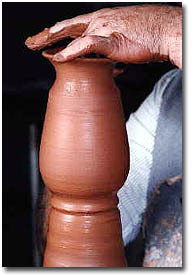 Pottery production in Totana, with its origin in medieval times, has been conserved to this day, maintaining the purest craft techniques. Nowadays, a wide repertoir of objects are continuing to be produced, in which traditional forms haven´t substantially changed since medieval age; given that its a generational profession, passed from parents to children, some of these pottery families were established half way through the 18th centruy, like Ayala; Subsequently, from the first half of the 19th century until today we find families which survive on the pottery profession like the Hernández and Cánovas, Polo or Clemente families who were active during almost all of the 19th century. The pieces are made from clay made from fuller´s earth and Roya extracted with pickaxes and hoes from the Canteras del Canvete which was transported in wagons to the workshop. Once there the different components are moulded together, mixed in a giant mortar and stamped on by foot until all the particles come loose, and afterwards left to decant eliminating all the small stones and impurities; it is then ready to be moulded and worked. Once modelled and aired, some of them will be glazed and finally prepared for firing in the morano wood ovens. Finally, there is a laborious process which gives each piece a particular and exclusive finish. Up until very recently everything was made for domestic use in the kitchen, at the table, or for preserving food etc, in particular, pieces such as the 'tinajas' (large earthen jars) and 'orzas' (glazed earthenware jar) for the preservation of liquids and food or the 'lebrillo' (earthenware bowl) used for washing and the 'cántaro' (pitcher) used to transport water, together with 'botijos' (earthenware jugs) and other specific objects. In the middle of the 18th century the majority of pottery shops were found on the banks of the Rambla de la Santa - in the Triana district - in the 19th century some were already being found in the former district of Sevilla - today Paseo de las Ollerías . With the arrival of the new century, pottery suffered waves in its production, however, the tinajas were very popular and became the potter´s number one product. In the middle of the century there was a decline in this craft sector due to the fall in the use of the domestic utensils, like the lebrillo or the cántaro and they started to make pieces for the garden, like flower pots and window boxes. At the same time a great innovation of variety of forms and treatment of the clay took place, they started to glaze the pieces with transparent glass, and worked white clay. Despite the competitiveness which exists today with indutrial production, the craft pieces, for their beauty and variety of shapes, are exported to European countries: France, Belgium, Germany and Holland. Today, more than ever, people want to maintain this old tradition and impress the potter´s stamp on the young people of Totana. For this reason they have created the ´Centro Tecnológico del Barro´ (Technological Centre of Clay) situated in an old morino oven found in the place known as ´Paseo de las Ollerías´, so-called because it was in this area where formally the old clay pots were made.